Communism has been an enduring presence on the French political scene for most of this century. It remains so in areas of the countryside, despite its collapse in the Soviet Union and in most of France's urban areas. Shifting the emphasis away from the often-studied relationship between communism and the working class, Laird Boswell proposes a new interpretation of the French Communist Party's success and illuminates rural social and political behavior during a critical period of economic crisis. 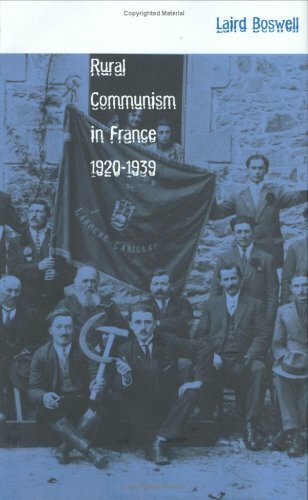 Drawing on extensive interviews with thirty-four surviving communist militants and an analysis of voter behavior, this book focuses on the Party's persistent strength during the interwar period in such rural strongholds as the Limousin and the Dordogne. Boswell shows how communism introduced modern politics in isolated rural communities, revived networks of village sociability and culture, and responded to the state's inability to cope with the massive upheaval brought about by the gradual disappearance of peasant society. Boswell challenges standard interpretations that attribute Party success in rural areas to leftist voting traditions, red republicanism, or family structures. By showing how French peasants used the political arena to defend their interests, his book provides significant insights on the nature of European communism and on the transformation of the French countryside in the twentieth century.